The siemens headquarter, called “The Crystal”, is located at the Royal Victoria Docks, the centre of London’s new Green Enterprise District, near the London’s 2012 Olympic Park. 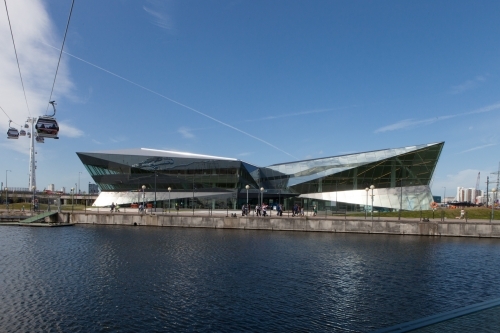 Beside the Siemens headquarter, “The Crystal” is home of a conference center, of cafes and restaurants, of an interactive exhibition and of global meeting places with views across the historic Royal Victoria Dock. 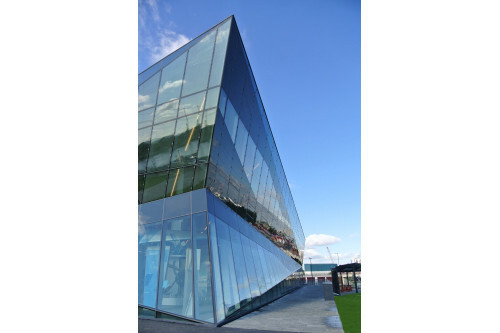 The building’s design is inspired by the many sides of a crystal, and creates a striking visual contrast to the surrounding skyline. The glass facades consist of shaped tubes with numerous kinks in and out of the façade, which underscore the crystalline structure. The project scope included the entire static calculation and thermal condensation and acoustic analysis regarding the facades. In plan the in total 8 facades describe two parallelogram forms with a side length of about 45m. The façade height is about 15m as its maximum.